Notice: We have a free custom service, pls email us if you have request. SIZE: 6# (Bust 34'', Waist 27''), 8# (Bust 36'', Waist 28''), 10# (Bust 38'', Waist 30''), 12# (Bust 40'', Waist 32''), 14W# (Bust 42'', Waist 35''), 16W# (Bust 44'', Waist 37''), 18W# (Bust 46'', Waist 39''). Pls refer to our Hanayome SIZE CHART, boby builds vary by person. CUSTOM SERVICE: We have a custom service (no additional charge), please give me email through amazon. OCCASION: It's suitable for versatile occasions: wedding, party, business meeting? daily and ect. This parcel comes with BLAZER & DRESS, which makes you outstanding in the crowd. This jacket is imported, it takes about 9 to 15 days to reach from you order it. 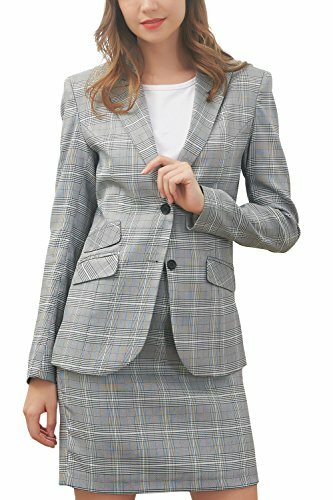 BLAZER'S FEATURE: Single Breasted, Three Pockets at Sides; Short Dress. If you have any questions about this product by Hanayome, contact us by completing and submitting the form below. If you are looking for a specif part number, please include it with your message.